“The healing of the Earth and the healing of the human spirit has become one and the same thing,” writes Jonathan Porritt. Taking Porritt’s point to heart, the Belfort-Group, Citizens In Action is hosting the first International Chemtrails Symposium in Ghent, Belgium on the weekend of May 28th – 30th, 2010. The group’s “Great Dream” is shared by chemtrails activists and everyone no longer content to be exploited by faceless elites. “While remaining detached from political, religious, ideological and other opinions, this citizens’ initiative wants to make a stand in Flanders – yet connected with similar initiatives from abroad – for truth, freedom and the integrity of mankind that are increasingly being compromised,” Peter Vereecke declares. The Belgium gathering comes just two months after 200 would-be geoengineers gathered at the “dreamy” Asilomar resort south of San Francisco to discuss planet-tinkering opportunities in the wake of the climate mitigation talks sabotaged by the U.S. and Canadian governments in Copenhagen. The “Asilomar International Conference on Climate Intervention Technologies” was funded by the Climate Response Fund, which hopes to profit from corporate-driven climatic catastrophe. “As Copenhagen went down the drain, all of a sudden we see the emergence of a Global Climate Crisis Management Team, ready to ‘geo-engineer’ us out of the mess,” observes University of Los Andes senior lecturer in political sciences, Jutta Schmitt. Among the chief science advisors of the Climate Response Fund, Schmitt points out, is Edward Frieman. An Institute of Geophysics and Planetary Physics research professor at the University California, Frieman is also Senior Vice President of Science and Technology at the notorious Science Applications International Corporation. Five years later, the controls proposed at Asilomar “were dismantled without anything like adequate knowledge of the hazards,” she adds. Invoking Gates is no coincidence. Hoping to hack a planet shared by billions of sentient beings, the megabillionaire software bully has for years funded two scientists at the forefront of geoengineering research. Ken Caldeira, of Stanford’s Carnegie Department of Global Ecology and physicist David Keith of the University of Calgary “will decide which technologies should receive the cash in order to alter the stratosphere to reflect solar energy, filter carbon dioxide directly from the atmosphere and brighten ocean clouds,” writes Wired’s Alexis Madrigal. Caldeira considers deep cuts in carbon dioxide emissions to be the most effective safeguard against environmental meltdown. Keith urges implementing these “fast, cheap and imperfect” technologies on a massive scale as “a hedge” against corporate-government insistence of driving and drilling as usual. Keith and his co-authors in the science journal Nature argue against negotiating an international treaty, or submitting to any kind of international regulation that could prove “burdensome” on research. Gates’ funding also helps support scientific meetings in geoengineering in Cambridge, Massachusetts, and Edinburgh, Scotland, and aeronautics research related to altering the stratosphere. Microsoft’s founder is spending at least $4.5 million to study massive chemtrail spraying, as well as technologies that filter carbon dioxide directly out of the atmosphere. Apparently, the virtual reality master has never heard of trees. Bill Gates is also an investor in Intellectual Ventures. Owned by Microsoft’s former chief technical officer Nathan Myhrvold, the Seattle, Washington firm has filed five patents for a technique to draw the heat energy from hurricanes by pumping cold ocean water some 500 feet to the surface using turbine-equipped barges. Caldeira claims that Gates’ monopoly money has not yet funded any field experiments. But Gates is bankrolling Silicon Valley inventor Armand Neukermans to develop a seagoing scheme to brighten ocean clouds. San Francisco-based research institute Silver Lining has already received $300,000 of seed funding from Gates to test a “cloud whitening” technology that could prove cheap way to simultaneously kill off Earth’s ocean and ozone layer. “Filtering” the already UV and pH-challenged phytoplankton that anchor the world food-chain and provide more breathable oxygen than all the remaining forests ashore – and tossing entire regions of these delicate organisms 3,000 feet into the air – have not been investigated or even acknowledged by Gates, who has yet to call a worldwide vote on a scheme that will allow carbon emissions to continue accumulating until the world ocean turns into a single acidic dead zone. Despite worldwide opposition, Gates’ Silver Lining Project is pressing ahead with its plans to screw around with an undisclosed 10,000 square-kilometre target – a patch of ocean as large as the initial BP oil slick. “This lobbying offensive has been underway for more than a year now but it has moved into a critical new phase. The world needs to pay attention,” warns ETC’s Diana Bronson.”We knew Microsoft was developing cloud applications for computers but we didn’t expect this,” explained Jim Thomas of ETC Group, one of the founding organizations of the H.O.M.E campaign “Bill Gates and his cloud-wrenching cronies have no right to unilaterally change our seas and skies in this way. A global moratorium on geoengineering experiments just became a whole lot more urgent and the meeting in Nairobi is a fine place to ensure that it gets put into place rapidly. International rules curtailing chemtrails and other geoengineering may result after scientists and diplomats from 193 nations meet May 12-20 in Nairobi. The 14th meeting of Subsidiary Body of Scientific, Technical and Technological Advice is the first time a UN Body has addressed geoengineering for the first time since the 1976 ENMOD Treaty banned environmental modification for “hostile uses”. SBSTTA 14 is already recommending that the United Nations Convention on Biological Diversity call on its member governments to impose a moratorium on all climate geoengineering activities when it convenes in Nagoya, Japan this October. Governments attending the Nairobi meeting agreed to forward the groundbreaking recommendation after near-unanimous support saw “strong statements” from countries in Africa, Asia, Europe and Latin America. On the final day, Canada announced it would not support the text. “Canada is the bête noire of climate change negotiations and nobody was surprised to see it stand out as the main objector to this proposal. The delegation itself was embarrassed,” observed Silvia Ribeiro. But British and American geoengineers “do not intend to wait for international rules on technology that deliberately alters the climate,” the London Times revealed. A similar moratorium on dead-zone spreading ocean fertilization techniques – supported by the German environment minister and adopted by the Biodiversity Convention in Bonn in 2008 – was quickly violated by another German ministry sponsoring an ocean fertilization experiment in the Southern Ocean. These messages are not getting through to the U.S. government, which continues to issue environmental waivers for further oil drilling in the Gulf of Mexico, even as it pursues chemtrails. Ignored by corporate media, the U.S. Congressional Geoengineering Committee has already met “two or three” times since November 2009 to assess the “Implications of Large-Scale Climate Intervention”. 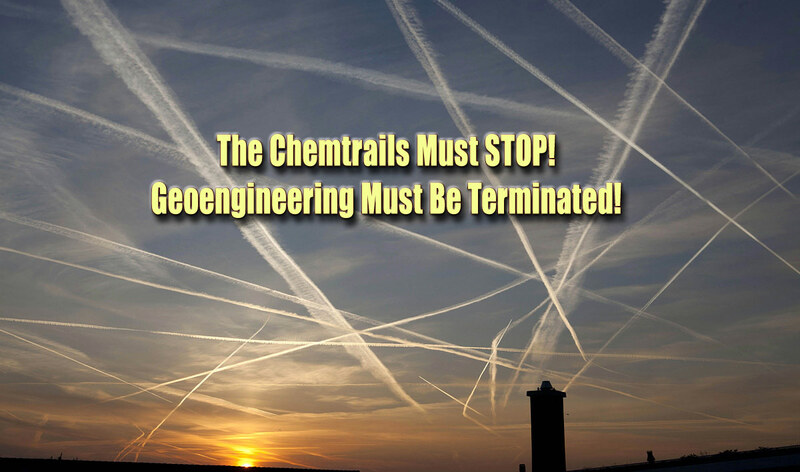 “At its best geoengineering might only buy us some time,” Gordon admitted. “Geoengineering carries with it a tremendous range of uncertainties, ethical and political concerns, and the potential for catastrophic environmental side-effects,” he warned – before urging that more experiments be carried out. “Big industry and big science want to press ahead with geoengineering either as a ‘plan B’, or as a free pass to avoid reducing emissions. It’s the big lie that lets them pretend that we can all carry on drilling and driving – business as usual!” derides Neth Dano of ETC Group in Nairobi. “My biggest problem with the backstop argument is that it encourages people to think there’s a do-over if we screw up our response to climate chaos, when in fact, we don’t have any proven response or remedy,” worries Worldchanging co-founder Alex Steffen. Vladimir Putin’s key science advisor, Yuri Izrael directed a sulphate aerosol experiment in Russia last year that avoided publicity before being picked up by a popular blog. Silvia Ribeiro at ETC Group’s Mexico office is not impressed by “the richest men and the richest countries in the world [beginning] actual experiments that tinker with the planet’s complex climate system that we do not fully understand. “Suggesting a ‘bottom-up,’ governance process for such top-down planet-altering technologies is absurd. If they want a real ‘bottom-up’ process, they need to start with the people at the bottom who have already been affected by industry-induced climate change.